i was going for bulky, as in lamb’s pride bulky on this set and i think i was pretty successful :) the one unpredictable thing about handspun is that some of it fluffs up really big and you sometimes can’t tell until after you wash it. and, as always, yarn is greener than it appears. I have to say that I’m quite smitten with this yarn and it’s subtle barber pole goodness. 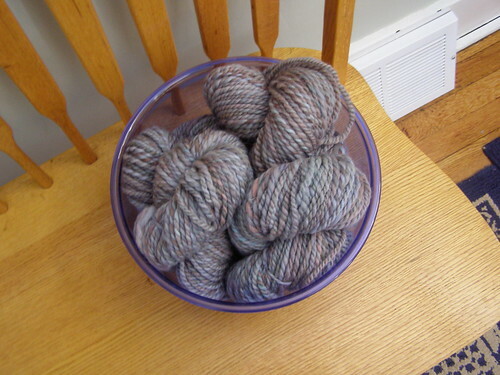 This yarn is beautiful. It has so much more color than the roving seemed to have. That is one thing I love about spinning. I am amazed at your ability and always enjoy reading your blog. I gave your blog a weird (check out my blog Feb. 2 post) award but don’t feel you have to follow through if you don’t want to. I do truly enjoy all your posts.